As many of you know, we've been making a Collage of André fans from all over the world with our "old" Baby pictures. 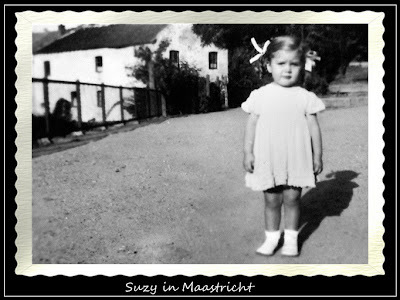 One of the lady's sent in her picture for the Collage and it was taken in Maastricht (where she lives) and the white house in the background is the house that André grew up in. I had to crop the house out of it for the Collage, so thought it would be fun to post the full photo on here so everyone could see it. It IS fun to see our baby pics so overwhelming, thanks for your great work, Sue! And it's certainly amazing to see how little Suzy knew long time ago that she'd be an André fan one day...even before little André himself started to play violin :) Very precious photo! So many stories behind those baby photos. If only each of them could talk about the day they were taken. I like that you put my photo 'down under'!!! Oh Sue,I really loved to see the collage of little Andre fans!!! What a brilliant idea that was!! Such a cute photo, lovely to see the house where Andre Rieu grew up, thnak you very much.